NEW MEMBERS ONLY SUBSCRIBER GIVEAWAY: Autographed Trace Adkins Liner Booklet! 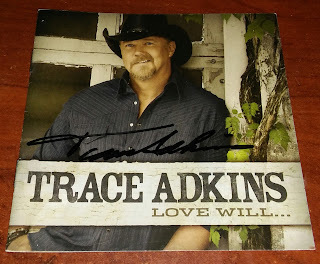 MusicCityMeetandGreets.com is giving away an autographed Trace Adkins Love Will... CD Liner Booklet! This giveaway is for the booklet only. CD not included. To be eligible for this giveaway you must be a new Members Only subscriber that has purchased a membership between Saturday, June 2, 2018 and Sunday, June 3, 2018. You will be automatically entered for this giveaway when you purchase a membership during the time listed above. No further action is necessary to participate. A winner will be selected at random on Monday, June 3, 2018 and will be notified by email. Subscribe to our Members Only Section Now!!! The odds of winning this giveaway are dependent upon the number of entries received and can not be disclosed at this time. This giveaway is not sponsored by, endorsed by, or in any way connected with Trace Adkins or the Country Music Association.